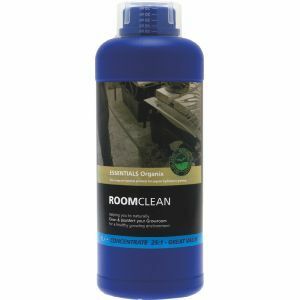 Essentials RoomClean is a powerful 100% natural cleaner and disinfectant for growrooms and greenhouses. When used regularly, RoomClean will keep your growroom and growing equipment clean and free from fungi and bacteria. RoomClean can be used on all hard surfaces such as metal, plastic, glass, wood, vinyl and painted surfaces. RoomClean is supplied in a 1L concentrate at 25:1 concentration ideal for mixing in a bucket for disinfecting growrooms at the end of a crop. There is no need to remove plants from the growroom before using this product! - Kills harmful bacteria - No need to remove plants - Safe for children and pets - 100% natural product. Dilute at a rate of 1 part concentrate to 25 parts water in a bucket or suitable container Remove any loose dirt, root material or soil with a brush or cloth. Apply to area/article to be cleaned liberally and leave for a few minutes before replanting or storing away.